Young Girl Proudly Announced that She's Using Abused Substances on Social Media! This girl will surely blow your mind as she proudly posting her pictures while she is holding and using abused substances. Taking these illegal medicines is one of the difficult problems of our society today. There were no age limits that can be influenced by this head screwing problem of our country. 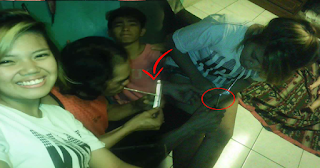 Bad effects that this abused substance can give its host brain damage, as it happens, users can easily create unusual activities that can cause trouble or harm to some other people unconsciously. This is the reason why it should wipe out in our country. It’s really hard to accept that people nowadays are getting involved with this kind of dangerous activity, especially those young people that supposedly studying or working for their brighter future. The name of this girl is Emzie Jumawan, she uploaded her pictures in her own Facebook account to proudly show to public that she’s an abusive user. There are many people concerned about her situation that they tried to spread her pictures to lift her case to the concern authorities, they believe that she can still be saved from this dangerous situation.